Also known as "Steam Cleaning", hot water extraction, as performed by Kentuckiana Carpet and Upholstery Cleaning LLC, is the cleaning method nearly all carpet manufacturers and carpet fiber producers recommend. It is the only cleaning method classified as "deep cleaning". All the others are considered "light surface cleaning" because they are incapable of removing soil deep in the pile. Also, all other methods leave large amounts of cleaning agent in the carpet after cleaning. In fact, the world's largest carpet manufacturer, Shaw Industries Group, states "Research indicates that the hot water extraction system provides the best capability for cleaning." Since 2000, Kentuckiana Carpet and Upholstery Cleaning LLC has been cleaning carpet via hot water extraction per manufacturer recommendation. 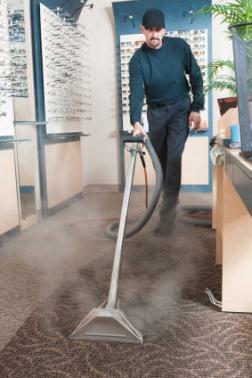 Hot water extraction is frequently called "steam" cleaning due to the fine spray of hot water used to force dirt out of the carpet which is sucked up by the vacuum slot immediately in front of the spray. Seldom is steam actually used, however. Kentuckiana Carpet and Upholstery Cleaning LLC's process consists of spraying a solution of hot water and detergent into the carpet pile and recovering the water and soil with a powerful vacuum into a holding tank. This can be done from a truck-mounted unit outside the home with only the hose and floor tool brought inside, or by a portable, system brought entirely into the home or office. Call (502) 935-2205 for a free hot water extraction for your carpets. Yes, you can achieve some of these results from renting a steam cleaning machine from your local hardware store. If you have ever attempted this you probably know that the machines generally don't have the strength (PSI) to remove all of the water from your carpets after cleaning them. The result is a carpet that is wet for days and has residual cleaning solution embedded in it, which can damage fibers. Kentuckiana Carpet and Upholstery Cleaning LLC utilizes powerful, state of the art carpet extraction machines that remove almost all of the water, resulting in clean carpets that dry within hours, not days!